Columbus, with a population of about 2000 people, is a popular resting place for visitors to Montana due to the town’s location right along Interstate 90. For visitors who never leave the interchange, Columbus isn’t likely to impress, as the interchange area contains the usual suspect of gas stations, fast food and hotels. The downtown area of Columbus, by contrast, is small but nice. 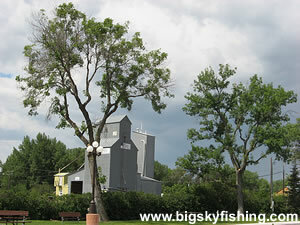 A city park runs the entire length of town, nestled in-between the railroad tracks and the shops of the downtown area. The downtown area has few empty storefronts, and the downtown buildings are well maintained. Columbus is more than a stop-over point for traveling motorists, however. The town has an excellent location for outdoor recreation. Two excellent rivers for trout fishing are located just outside of town, the Yellowstone River and the Stillwater River. Additionally, the Stillwater River, which joins with the Yellowstone River just outside of Columbus, is a popular river for floating and fishing trips. One popular trip starts near Absarokee, floats down the Stillwater River until it meets the Yellowstone River, and then ends at the fishing access site just outside of Columbus. Several scenic drives also begin in and around Columbus. The Beartooth Front Scenic Drive, which follows Highway 78 between Columbus and Red Lodge, begins right in town. The Bridger Creek Backcountry Drive and the Absarokee Loop Scenic Drive are also nearby, beginning twelve-miles down the road in Absarokee. Since Columbus is just forty-two miles from Billings by Interstate 90, Columbus has seen growth recently from people who live in Columbus and commute to work in Billings. Additionally, several real estate developments – mainly but not exclusively catering to out-state buyers – have sprung up in the forested hills outside of town. However, Columbus is a long ways from being over-run by new residents and still maintains its small town character. Although the bulk of visitors to Columbus never leave the Interstate 90 interchange, many tourists still pass through the downtown area. Highway 78 is the primary road used by eastbound interstate traffic to reach Red Lodge, the Beartooth Highway and Yellowstone National Park. Overall, due to the many services and shops in Columbus, the town serves as both a travelers’ rest stop and as a small hub for people who are camping, fishing or simply exploring this scenic part of Montana. Those who are passing through on Interstate 90 should take the time to explore the downtown area as well as head down to the park along the Yellowstone River. For those with a tent or RV, along the Yellowstone River is a fishing access site and a town park - both of which provide camping. For lodging that includes electricity, there is the Super 8 along with one or two small privately owned motels.